At ICSA, we are privileged to collaborate with many insightful company secretaries, governance professionals and inspirational leaders, and have drawn some of their recommendations together into our top ten development actions. 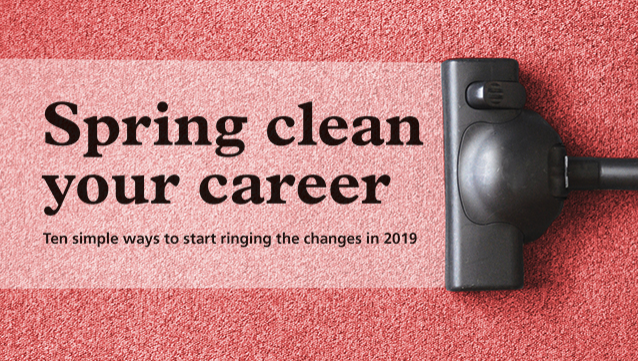 We hope that some of these simple suggestions will get you thinking about how to become your professional best in 2019. Cast your mind back month-by-month over the key events of 2018 to reflect on what happened. How have you contributed to the teams and projects that you have been involved with? What were your personal milestones such as passing exams, delivering a speech, switching jobs or navigating new situations? Make a list of your key learnings, highlighting the activities that energised you. This will help you to recognise what you’ve achieved and identify the areas that you want to build on. Curiosity and a capacity for lifelong learning are two common traits of governance professionals. Often we learn instinctively, but why not decide to be more proactive this year, and set yourself a learning goal in your professional or your personal life? If you decide what you want to do at the start of the year you are far more likely to set aside the time and resource to achieve it. We all benefit from participating in at least one network and most people will belong to several formal and informal groups. What do you belong to? And how does it make you feel? Do a quick audit of your networks, thinking about how often you participate, in what way, and with what impact. What gaps do you need to fill? Are there networks available to you, in your organisation, your wider professional world, such as an industry, ICSA branch or alumni group, or groups in your local community that you have never explored? If so, why not get out there and give them a try to create relationships that may take you in a new direction? Finding solutions is very rewarding, and the impacts are often felt by others as well as ourselves. If there is something in your professional life, or your wider community that just isn’t working, consider what you can do to fix it. This could involve anything from reviewing and eliminating poor process, reorganising your resource or getting new tools to do the job, to forming a network, responding to a consultation or starting a campaign. The choice is yours, but the benefits will certainly ripple out beyond you. We regularly meet many bright young people who want to explore whether a career in governance is for them. They typically face two challenges. The first is that the governance world is less visible than other professions, and the second is that they face the Catch 22 situation of having to have some experience in order to get their first opportunity. For the last couple of years we have been encouraging our members to offer careers taster experiences to students or recent graduates who are considering choosing company secretarial. These range from work experience schemes, to simple one day shadowing and the opportunity to attend AGMs to discover what it is all about. If you can extend a helping hand to someone at the beginning of their career by offering a taster experience in your organisation, it could make a real difference. You may benefit too by meeting someone you want to hire, and will be contributing to the development of the available talent when we all seek to recruit. When you have a passion for what you do it is infectious. So don’t keep your ideas and inspiration to yourself. Find a platform to share your ideas and connect with others, such as contributing to an event as a speaker, or writing a blog. It may be a slightly nerve-wracking prospect but the buzz that you will get from putting yourself out there will be worth it. And if you do it regularly, it will in turn raise your profile in ways that may open new doors in the future. We can all name someone who has catalysed or supported us in our development. Perhaps it was an incredible teacher, a brilliant boss or a trusted colleague who was a sounding board at a challenging time. Why not be that person for someone else by becoming a mentor? There are lots of mentoring schemes available, including two dedicated to supporting company secretaries and governance professionals, offered by ICSA and the Association of Women Chartered Secretaries. Both provide structures to work within and training for mentors as well as matching you with someone to whom you can make a difference. Once you have decided what your development focus will be, think about how you are going to make it happen. Perhaps you need to write yourself an action plan, book yourself onto a course or event, or simply reach out to others and make diary dates to ensure that you really do take the next steps and don’t just think about it. When you have completed your review and made your plans, take an hour or two to update your professional profile whilst your recent achievements and future goals are top of mind. Re-energise your CV, so that it is fresh at hand when you next need to use it, and enrich your LinkedIn profile to keep it interesting and open to new connections. Professional development is a serious business, but it’s essential to have fun too. Whatever your goals for in the coming year, be sure to leave yourself some space for relaxation and revival. You’ll put your well-being at risk if you overcommit and forget to keep doing the things that keep a smile on your face and recharge your batteries.